Destroy deadly bacteria and keep humanity’s precious antibiotics working for as long as you can in this free, fast-paced, and addictive action game. The story of this casual, real-time puzzle game comes straight from today’s headlines: The rise of superbugs, resistant bacteria which can’t be killed by the drugs we rely on to fight infection. 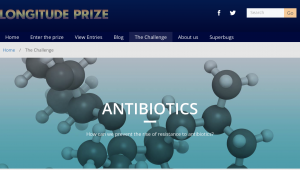 In order to tackle growing levels of antimicrobial resistance, the challenge set for the Longitude Prize is to create a cost-effective, accurate, rapid and easy-to-use test for bacterial infections that will allow health professionals worldwide to administer the right antibiotics at the right time. Seems very interesting and important. I encourage people to look at the prize details and consider applying. The prize has been open for applications since 2014 and they assess applications every few months to see if a winner is to be selected. Thanks for the post! I can not wait to participate in the game. Do you feel that this game could also be a learning tool for younger generations?